By her own admission, Fiona Conacher was not looking forward to being 40. 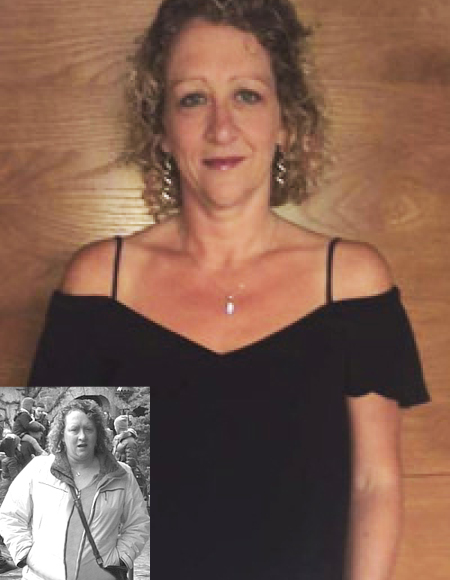 She had piled on a lot of weight over the years, even more so after a hysterectomy in March 2014 had left her immobile for a short period of time - and she was well on the way to hitting 16 stone. I was just so fed up of feeling fat and frumpy, wearing the same old clothes, day in, day out and hiding behind 'safe' colours with a marked lack of style! All tunics and loose trousers designed to cover me up. I was fully aware that the 'Big 4-0' was also creeping up on me, and whilst I couldn't do anything about that, I knew I could do something about my weight. Determined to ditch her shapeless outfits and take back control of her body, Fiona turned to the internet to do some diet research. As the owner of a computer games store - and a tech addict - Fiona was keen to embrace technology in her bid to lose weight. She found Nutracheck in the App store: "it just popped up so I thought I would give it a go" - and she has never looked back. Today, mum-of-two Fiona is over five and a half stones lighter, dropping from a dress size 18 right down to a size 8. She has ditched her unflattering, shapeless tops and now delights in flattering, fitted tops and size 8 skinny jeans. Fiona found the simplicity of the App worked perfectly for her and fitted easily into her busy daily routine. I had tried countless other diet plans and got hooked into spending money on branded packaged foods which I wasn't keen on – it never felt like proper eating to me. But counting calories and understanding portion sizes makes total sense to me. I was horrified by my interpretation of 'a portion of pasta' - I was totally oblivious to what a 'portion' looked like and I was simply serving myself way too much. Nutracheck helped me understand these food basics and once I got the hang of it, I found it all incredibly straightforward". I have learnt my own way of cooking and a lot of it is just common sense. I used to make my own bread with a breadmaker which was lethal because I would eat so much. Now I have switched to sandwich thins which makes a big difference to my calorie intake. On the whole, it hardly takes any effort to make fresh, filling meals that I bulk up with a variety of vegetables and fruit. It's very easy to incorporate calorie counting into my daily routine - it takes a matter of minutes to add what I eat to my food diary, the calories are totted up for me and I can see whether I am on track against my daily target. Because there are no banned foods, I know I can have a treat if I want one, as long as I count those calories honestly. And if I cheat, I'm only cheating myself". I couldn't be more pleased with my new shape, my new-found confidence and complete change of clothing style. I'm thrilled to be able to wear skinny jeans and fitted tops, which are a world away from my old wardrobe.